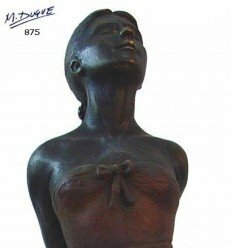 In the 19th century Europe begun the realistic movement in sculpture, with the goal of showing the reality just as it is, as it surrounds us, today we find magic realism of the Spanish artist Antonio López, artworks which entrap us without a touch of being artificial. 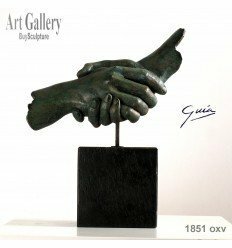 At our gallery you will find realistic works of Martin Duque (student of Antonio Lopez from Madrid), Lorenzo Quinn and those of Miguel Guía. 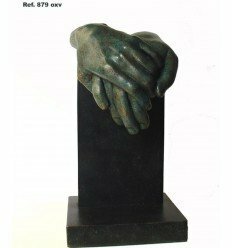 Abstract sculptures are nothing new, their roots are dated back to the Ancient Egypt, african art, as well as pre-Columbian works; all of which used abstract for artistic expression. Already in the 19th century Europe artists begun to propose styles seen now as abstract, for instance: Henry Moore, Constantin Brancusi. In Spain appeared:, Eduardo Chillida, Jorge Oteiza, Julio Gonzalez ( Picasso’s teacher). 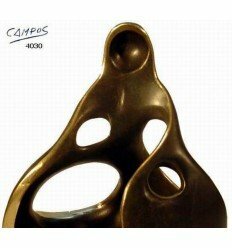 At our gallery you will find abstract works of Guía, Moreno Linares, Canduela, Caramagano, J.L. Toledano etc. In the last century Europe saw development of a movement now called Cubism, an attempt at representation of multiple dimensions of one and the same object. Genius artists such as Pablo Picasso, Georges Braqué, Jean Metzinger, Albert, Gleizes, Robert Delaunay, Juan Gris and Jaques Lipchitz are great examples of the strength and significance of this movement. 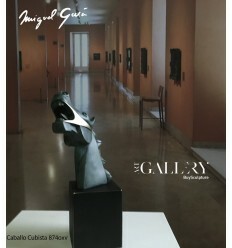 At our gallery you will find cubist artists of Miguel Guía. When talking of the impressionism one should start with August Rodín, a french sculptor who brought impressionism in sculptures to its highest, his works show great power of the unfinished. Other artists that can’t be ignored is Alberto Giacometti, whose brought abstraction and simplicity into the impressionism. At our gallery you can enjoy impressionist creations of such authors as: Martín Duque, Jesús Campos, Pedrín and Fernandez de cura. Throughout the history human body has been present in the art constantly, the need to represent gods, heroes or simple human form in the hunt, maternity, love and other of multitude of human expression. Sculptures of entire body, of a man, a woman, or of children, busts, hands or Esculturas de cuerpo completo, de hombres mujeres y niños, torsos, bustos, Manos. Since the prehistory, Egypt, Mesopotamia, Asia etc.. until today, we can find multitude of artistic visions on human being showing us as all of the numerous faces a human can display. Since creation by Velázquez of the famous meninas painting, as well as other painting of his representing queens and infants, numerous artists have attempted at representing different styles of Meninas, in particular Manolo Valdés, with his abstract and impressionist representations of the Meninas. 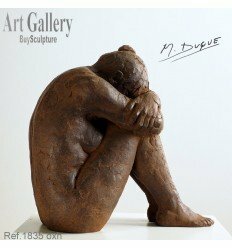 At our gallery you will find several approaches to the Meninas created by known artists such as Martin Duque or Miguel Guía. Alike the human forms, the representation of animal world has always been a strong inspiration, from the earliest paintings depicting the hunt, or objects made out of animal bones, to realistic or simple abstract representations of the beauty in and animal. 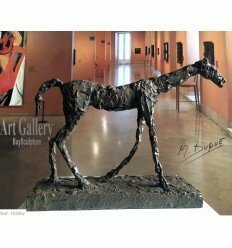 At our gallery you will find Horses, Cats, Dogs etc in different styles and interpretations. The cubism, a current of avant-garde art that began in Europe at the beginning of the 20th century as a result of the vanguards of the moment, heirs to the currents of the 19th century (1887-1964) and opens a way for many artistic trends of the beginning of the century. It, at first, developed in Paris in 1909 at the hands of Juan Gris with his paintings of some planes and volumes of a synthetic cubism with the use of collage as a recurrent method in his still life. The great George Braque with his analytical cubism, and the great Pablo Picasso -disciple of Julio González- as a great genius who impregnated his time with his great work the damsels of Avignon, which marked the before and the after in the style. Pablo Gargallo who works on the human figure is also worth noting. At the Reina Sofía Museum we can find a large sample of Gargallo works, including sculptures of the entire body (the prophet) as well as one of Picasso's most famous paintings, Guernica. 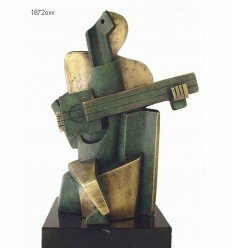 Another representative of Cubism is the artist Jacques Lipchitz, who with his Sailor with guitar, shows us a sculpture full of planes and geometry that is characteristic of analytic Cubism. One of the most prominent representatives of this current was the Russian Alexander Archipenko, the influence of the first on the later is clear. Speaking of Cubism we cannot forget Raymond Duchamp Villon, one of the leaders and creators of trend that gives great expressiveness to the style. Currently we can enjoy the works by Miguel Guía, who returns us to creation of works of this style again in the 21st century, cubist works, reopening the style with a very personal and current contribution. Jacques Villon, was a French painter influenced by cubism. Born in Damville, specifically in 1875. Many collectors decide to buy cubist sculptures that are a common predilection, since all art connoisseurs, whether private collectors, gallerists, art dealers or lovers of art, appreciate the effort to get out of the already established "istas" from Paris, who wanted to change the perception of art, like the impressionists, the pointillists and the cubists. The latter, cubism, leads us to remember the great master Pablo Ruiz Picasso, who after finishing the art school, where he already showed a great mastery of technique, followed his own instinct, leading him to create his own pictorial language, even experimenting with a collage of photos and arriving at a point where, for the universal exposition of Paris, in the Spanish pavilion, he dominated his cubist language, and after an insistent petition, he relied to the bombing of Guernica to create his famous pictorial work "Guernica" icon of the cubist movement. Investment in art is another relevant factor in the purchase of works, whether Cubist or other styles. The case of the skeptics who criticized Constantin Brancusi's series of sculptures, known as Bird in Space, were in an uncomfortable situation, when in 2005 they sold for 27.5 million dollars. Auguste Rodin marked his way into Impressionism, when Picasso was still trying to gain a foothold in the art market, through the art dealers in Paris and accepting commissions, Rodin and his drawing of the human figure, through the Thinker already achieved that our minds were able to recognize those to be drawings of a person, with his impressionistic language. The cubist sculptures try to reflect several visions of the same figure from several points of view. In history, although not thinking about achieving this precisely, we can see how this resource was used, (rather a lack of perspective) in African art. It is here, where we see wood carvings or drawings in which the same object is seen from different angles simultaneously. It is evident that both African art and pre-Columbian art served to the artists who created the Cubism as the spring. For example, in Picasso his inspiration in African art is very noticable. We cannot fail to see reminiscences of African drawings in his cubist sculptures. The word Cubist comes from the derogatory term used by the French critic Vauxcelles. This one, defined "cubist" as the cube superposition. Both in drawings and cubist sculptures. It was the first vanguard that broke with all the previous, giving a very different vision to the realization of a world with a totally new approach. The Damsels of Avignon (Moma in New York) by Pablo Picasso, is an icon of Cubism. This work has been interpreted as the beginning of cubism. Within the cubist sculptures, we can also stress the significance of Picasso’s self-portrait. Juan Gris, mentioned at the beginning, also a spaniard, developed a great pictorial work being seen as one of initials of cubism. Although he did not delve into cubist sculpture. He continued to develop his style through his pictorial art. All this was developed in France (Paris) in juxtaposed stages, between the years 1907 and 1914. A period rich in breaking away from the molds and ties of classical art, as it was known until that moment. Although not until Picasso, that the Cubism becomes a worldwide and recognized movement, both in painting and sculpture. 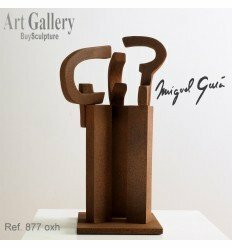 In our Buysculpture Art Gallery, we can see our sculptor Miguel Guía, who set out to open the cubism window again. To do this, he modeled large cubist sculptures in the late 20th century and early 21st century. These sculptures show a new Cubism, without stopping taking from the same fountains that the first Cubists in Paris took.